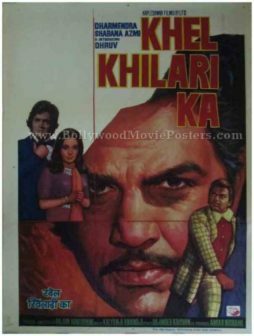 Old Indian movie poster for sale of the classic Hindi film Khel Khilari Ka (1977). This is an actual surviving old Indian film poster of the 1977 Hindi film that featured the original He-Man of Bollywood, Dharmendra in the lead role. Printed and circulated during the original first release of the film in the late 1970s, this vintage Indian poster for sale was printed for publicity of the film but never ended up being used. This old Indian movie poster for sale was originally designed in hand painted oil on canvas format by a leading poster art studio in Bombay. A large hand painted close up portrait of Dharmendra is seen prominently on the poster. A cross hair is seen marking his face. One side of his head appears cut out. The top portion has been left blank in this interesting old school Bollywood poster design. A smaller full figure of Dharmendra is seen hand painted on the bottom right corner of this old Indian poster. Brilliant hand painted figures of actress Shabana Azmi and debutant actor Dhruv are seen on the center left of this Indian movie poster for sale. 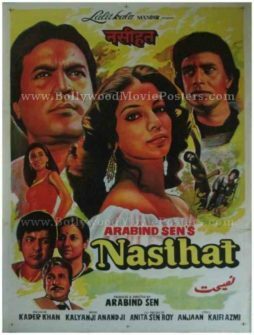 Old Bollywood poster for sale of the classic Hindi film Nasihat (1986). This is an actual surviving vintage Bollywood poster for sale of the 1986 Hindi film that starred Rajesh Khanna, Shabana Azmi, Mithun Chakraborty and Deepti Naval in pivotal roles. Printed and circulated a few years after the first release of the film (somewhere in the late 1980s), this old Bollywood poster for sale was designed for publicity of the film but never ended up being used. This vintage Bollywood poster was originally hand designed in oil on canvas format. The quirky hand drawn techniques of old school Bollywood poster painters is starkly evident in this old Bollywood poster. Quirky hand painted portraits of the lead actors are seen in various poses in this vintage Bollywood poster. A prominent hand drawn portrait of lead actress Shabana Azmi is seen in the center of the poster. She is flanked by Rajesh Khanna and Mithun Chakraborty. 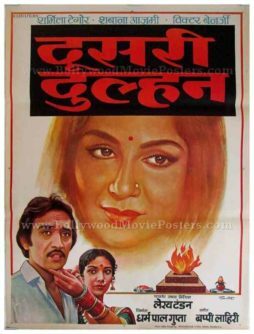 Deepti Naval is seen in a smaller avatar on the left of this old Bollywood poster. A fight scene from the film is depicted on the right. The poster is set against a rough hand painted background with broad, visible brush strokes. Smaller bust sized hand drawn portraits of key supporting actors are seen at the bottom of this old Bollywood poster for sale. 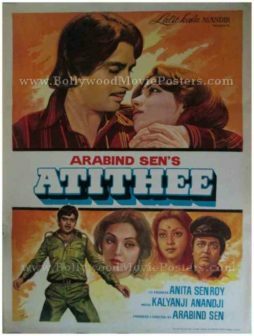 Old Bollywood poster for sale of the romantic Hindi film Atithee (1978). This is an actual surviving old Bollywood poster of the 1978 Hindi movie directed by Arabind Sen that featured Shashi Kapoor, Shatrughan Sinha & Shabana Azmi in lead roles. Printed and circulated during the original first release of the film in the late 1970s, this old Bollywood poster was printed for publicity of the film but never ended up being used. This old Bollywood poster was originally designed in hand painted oil on canvas format by one of the most talented Bollywood poster designers of all time, V.G. Parchure of Pamart Studio fame. This old Bollywood poster bears the printed signature of Bollywood poster painter V.G. Parchure in the name of his art studio, i.e. Pamart on the bottom left hand corner. Bollywood poster painter Parchure’s mastery over the paint brush is clearly seen in this spectacular old Bollywood poster. Highly realistic hand painted portraits of actors Shashi Kapoor and Shabana Azmi locked in a passionate gaze are seen prominently on the top. Smaller portraits of Shatrughan Sinha, Deven Verma, & Vidya Sinha are seen at the bottom of the poster. Broad visible brush strokes are seen in the background of this old Bollywood poster for sale. Old Amitabh Bachchan movie poster of the popular Hindi film, Parvarish (1977) for sale. This is an actual surviving old Bollywood movie poster of the 1977 film starring the biggest superstar of Indian cinema, Amitabh Bachchan. Printed and circulated shortly after the first release of the film (somewhere in the late 1970s), this old Amitabh movie poster was originally designed for publicity of the film but never ended up being used. This old Amitabh movie poster was originally designed in hand painted format using oil paints on canvas by a leading art studio in Bombay. This beautifully hand painted old Bollywood poster captures the original angry young man of Bollywood, Amitabh Bachchan in stunningly realistic portrait. A hand painted portrait of Vinod Khanna appears alongside. The film's title, Parvarish, appears in yellow in stunning typography in this old Amitabh movie poster. Parvarish (Upbringing) is a 1977 hit Hindi film directed by Manmohan Desai, starring Amitabh Bachchan and Vinod Khanna in lead roles. The other cast of the film includes Shabana Azmi, Neetu Singh, Amjad Khan and Kader Khan. The film is credited with establishing Shammi Kapoor's entry into character roles. 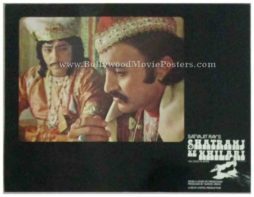 Rare surviving set of old Satyajit Ray movie stills of the highly acclaimed Hindi movie Shatranj Ke Khilari (1977) for sale. This is an actual surviving set of old Satyajit Ray movie stills of the 1977 film Shatranj Ke Khilari that was written and directed by India’s finest filmmaker. Featured here for sale is a highly collectible set of seven Shatranj Ke Khilari photos in unused condition! Printed and circulated a few years after the first release of the film (1980s), this set of seven Satyajit Ray movie stills was printed for publicity of the film inside a cinema hall but never ended up being used. 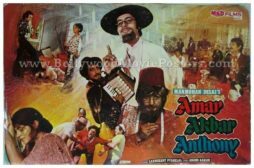 Amitabh Bachchan old movies poster of the blockbuster Hindi film, Amar Akbar Anthony (1977) for sale. This is an actual surviving old Amitabh movie poster of the 1977 film that featured the greatest superstar of Indian cinema in the lead role along with Rishi Kapoor and Vinod Khanna. Amar Akbar Anthony was the biggest blockbuster of 1977 and and won several awards at the 25th Filmfare Awards including Best Actor, Best Music Director and Best Editing, making this poster highly collectible. Printed and circulated a few years after the original first release run of the film (somewhere in the late 1970s / early 1980s), this old Amitabh movie poster was originally designed for publicity of the film but never ended up being used. This Amitabh Bachchan old movies poster was intended to be used as a showcard inside cinema halls but never ended up being mounted on boards. This old Amitabh movie poster was originally designed on a collage board by the greatest and most expensive Bollywood poster artist of all time, Diwakar Karkare, owner of Studio Diwakar. His printed signature is seen on the bottom left of the poster. This Amitabh Bachchan old movies poster features still photos of several key scenes from the film. The memorable fight scene between Amitabh Bachchan and Vinod Khanna is seen featured prominently at the left center of the poster. This old Amitabh movie poster has been graded as ★ As Is due to several missing pieces along its borders. Please purchase only if you are okay with owning a damaged poster. Amar Akbar Anthony is a 1977 Bollywood blockbuster directed by Manmohan Desai. The film starred Amitabh Bachchan (as Anthony Gonsalves), Vinod Khanna (as Amar) and Rishi Kapoor (as Akbar). Amar Akbar Anthony was a golden jubilee at the box office and has been catapulted to cult status over the years, establishing itself as a landmark in the “Bollywood masala” genre. The film was ahead of its time, in that it was one of the first films to exploit merchandising to both generate revenues as well as publicity. Songs from Amar Akbar Anthony composed by the music composer duo Laxmikant-Pyarelal became a rage throughout the nation. Tracks like “Parda Hai Parda” sung by Mohammed Rafi, “My Name Is Anthony Gonsalves” sung by Kishore Kumar and “Anhoni Ko Honi Karde” are fondly remembered and played till date. Amar Akbar Anthony is remembered for one of superstar Amitabh Bachchan’s finest performances. The cult “band-aid mirror” scene is fondly remembered and reenacted by Amitabh till date in numerous interviews and reality show appearances. Vintage Bollywood poster of the blockbuster Hindi film, Amar Akbar Anthony (1977) for sale. This is an actual surviving vintage Bollywood movie poster of the 1977 film that featured the greatest superstar of Indian cinema, Amitabh Bachchan in the lead role along with Rishi Kapoor and Vinod Khanna. Printed and circulated a few years after the original first release run of the film (somewhere in the late 1970s / early 1980s), this old Amitabh movie poster was originally designed for publicity of the film but never ended up being used. This Amar Akbar Anthony film poster was intended to be used as a showcard inside cinema halls but never ended up being mounted on boards. This old Bollywood poster was originally designed on a collage board by the greatest and most expensive Bollywood poster artist of all time, Diwakar Karkare, owner of Studio Diwakar. His printed signature is seen on the bottom right of the poster. This Amar Akbar Anthony film poster features still photos of several key scenes from the film. Rishi Kapoor is seen in a small photographic still from the hit song, “Shirdi Wale Sai Baba” on the right hand corner of the poster. Amitabh is seen smoking a cigarette and a photographic still of Vinod Khanna in a police uniform is pasted alongside. This old Bollywood poster has been graded as ★ As Is due to several missing pieces along its borders. Please purchase only if you are okay with owning a damaged poster. 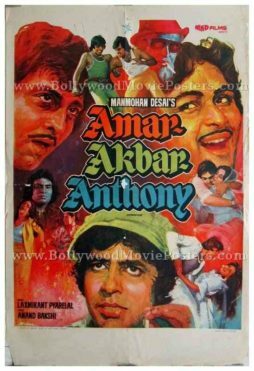 Old Bollywood poster of the blockbuster Hindi film, Amar Akbar Anthony (1977) for sale. This is an actual surviving vintage Bollywood movie poster of the 1977 film that featured the greatest superstar of Indian cinema Amitabh Bachchan in the lead role along with Rishi Kapoor and Vinod Khanna. Printed and circulated a few years after the original first release run of the film (somewhere in the late 1970s / early 1980s), this old Amitabh movie poster was originally designed for publicity of the film but never ended up being used. This Amar Akbar Anthony film poster was originally intended to be used as a showcard inside cinema halls but never ended up being mounted on boards. This old Bollywood poster was originally designed on a collage board by the greatest and most expensive Bollywood poster artist of all time, Diwakar Karkare, owner of Studio Diwakar. His printed signature is seen on the bottom left of the poster. This Amar Akbar Anthony film poster features still photos of several key scenes from the film. A large photographic still from the hit song, “Parda Hai Parda” is seen prominently at the center of the poster. Original vintage Bollywood poster of the blockbuster Hindi film, Amar Akbar Anthony (1977) for sale. Printed and circulated a few years after the original first release run of the film (somewhere in the late 1970s / early 1980s), this Amitabh Bachchan old movie poster was originally designed for publicity of the film but never ended up being used. This old Bollywood movie poster was originally intended to be used as a showcard inside cinema halls but never ended up being mounted on boards. This photographic old Amitabh movie poster was originally designed on a collage board by the greatest and most expensive Bollywood poster artist of all time, Diwakar Karkare, owner of Studio Diwakar. His printed signature is seen in white on the bottom center of the poster. This Amar Akbar Anthony film poster features still photos of several key scenes from the film. A large photographic still from the hit title song, “Anhoni Ko Honi Karde” is seen prominently at the center of the poster. Extremely rare, original vintage Bollywood poster of the blockbuster Hindi film, Amar Akbar Anthony (1977) for sale. Printed and circulated somewhere during the original first release run of the film (somewhere in the 1970s), this Amitabh Bachchan old movie poster was originally designed for publicity of the film but never ended up being used. This hand painted Bollywood poster was originally designed on canvas by the greatest and most expensive Bollywood poster artist of all time, Diwakar Karkare, owner of Studio Diwakar. His printed signature is seen in white on the bottom left of the poster. This Amar Akbar Anthony film poster is a striking example of Diwakar Karkare’s mastery. Flawlessly executed, this hand painted Bollywood poster features a total of thirteen highly accurate portraits – all displaying amazing synergy and coherence with the overall design. Superstar Amitabh Bachchan is seen in a superb hand painted rendition on the bottom, smoking a cigarette. Another striking portrait of Rishi Kapoor presumably in a dancing pose from the iconic song, “Parda Hai Parda” is seen on the right of the poster. This vintage Bollywood poster has been professionally restored by an expert paper archivist. It has been backed on cotton using a thorough acid-free conservation and restoration process. Minor paper loss has been adequately filled which make no noticeable difference to the display quality of the poster when seen from a viewing distance. 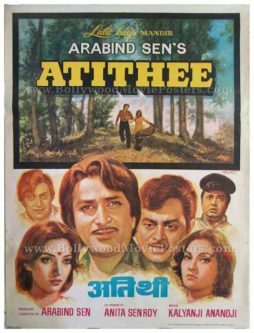 Old hand painted Bollywood poster of the romantic Hindi film Atithee (1978) for sale. This is an actual surviving vintage Bollywood poster of the 1978 Hindi movie directed by Arabind Sen that featured Shashi Kapoor, Shatrughan Sinha & Shabana Azmi in lead roles. Printed and circulated prior to the original first release of the film in the late 1970s, this old Bollywood movie poster was printed for publicity of the film but never ended up being used. This vintage Bollywood poster was originally designed on a hand painted canvas by one of the most talented Bollywood poster designers of all time, Parchure. The poster bears the printed signature of Parchure in the name of his art studio, i.e. Pamart on the center right hand corner. Bollywood poster painter Parchure’s flair for realism is seen clearly in this superbly painted movie poster. Highly realistic hand painted portraits of actors Shashi Kapoor, Utpal Dutt, Shatrughan Sinha, Deven Verma, Shabana Azmi & Vidya Sinha are seen at the bottom of the poster. A beautiful romantic scene taken from a song in the film is seen painted on the top. 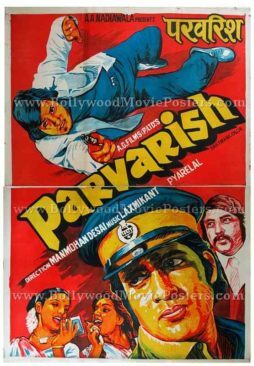 Rare two sheet vintage Bollywood poster of the popular Amitabh Bachchan film, Parvarish (1977) for sale. Printed and circulated a few years after the first release of the film (somewhere in the 1980s), this movie poster was originally designed for publicity of the re-release of the film but never ended up being used. This poster was originally designed in hand painted format using oil paints on canvas by a small time art studio, giving it a very quirky hand drawn appearance. This eccentric, old hand painted Bollywood poster captures the original angry young man of Bollywood, Amitabh Bachchan, in a striking pose wearing a police uniform. A portrait of Vinod Khanna is seen in an action pose on the top. The film’s title, Parvarish, appears in yellow in stunning typography in this old Amitabh movie poster. Two sheet posters comprise two separate individual single sheet posters measuring 40″x30″ inches each. When pasted together they line up perfectly and together form one single two sheet poster. In the image shown alongside, there may be a slight gap visible between the two – as the images of the top and bottom half have been photographed individually and then joined together digitally. When framed or pasted, there will be no gap visible between the two sheets and the appearance of the poster would be seamless – i.e. just like a single sheet poster. 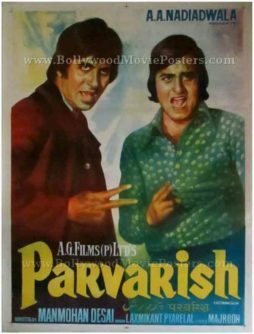 Parvarish (Upbringing) is a 1977 hit Hindi film directed by Manmohan Desai, starring Amitabh Bachchan and Vinod Khanna in lead roles. The other cast of the film includes Shabana Azmi, Neetu Singh, Amjad Khan and Kader Khan. The film is credited with establishing Shammi Kapoor’s entry into character roles. Stunning old hand painted Bollywood poster of the Hindi film Doosri Dulhan (1983) for sale. This is an actual surviving vintage movie poster of the 1983 film that featured actresses Shabana Azmi & Sharmila Tagore in lead roles. Printed and circulated during the first release of the film (early 1980s), this old Bollywood movie poster was originally designed for publicity of the film but never ended up being used. The poster was originally designed on a hand painted canvas by one of the leading Bollywood poster design studios in Mumbai called Pamart, making it very collectable. Master Bollywood movie poster artist Parchure depicts the lead actresses in stunningly accurate hand painted portraits. The poster bears the original signature of Bollywood poster painter Parchure on the bottom right, in the name of his studio, i.e. Pamart. A holy fire signifying a wedding ceremony is seen at the bottom of the poster. Doosri Dulhan (Second Wife) is a 1983 Bollywood movie starring renowned actresses Sharmila Tagore and Shabana Azmi. The film tackled the sensitive issue of surrogate pregnancy through its daring plot. Shabana Azmi earned the praise of critics for her role as a prostitute who is hired as a surrogate mother to a childless couple in the film. Old Bollywood movie poster of the Hindi film Kaamyaab (1984) for sale. This is an actual surviving publicity poster of the 1984 film that featured the ‘Jumping Jack’ of Bollywood, Jeetendra in the lead role. Printed and circulated during the first release of the film (somewhere in the mid 1980s), this black and white Bollywood poster was printed for publicity of the film but never ended up being used. This poster was originally designed by cutting out images of actors from separate still photographs (shot on set location) and pasting them on a board. The background and typography are hand drawn / hand painted, which makes this black and white Hindi movie poster an interesting mix of two very different design techniques. This very colorful and retro Bollywood movie poster features black and white still photos of seven beautiful actresses surrounding a large close up cut out of lead actor Jeetendra. Kaamyaab is a 1984 old Hindi film starring Jeetendra in the lead role. Supporting cast includes Asrani, Shabana Azmi, Rita Bhaduri, Satyendra Kapoor, Shakti Kapoor, Amjad Khan & Kader Khan.